SlashData’s Developer Economics is the leading research programme on mobile, desktop, IoT, cloud, web, game, augmented and virtual reality, and machine learning developers as well as data scientists. It tracks the developer experience across platforms, revenues, apps, languages, tools, APIs, segments, and regions, based on the responses of more than 40,000 developers annually. 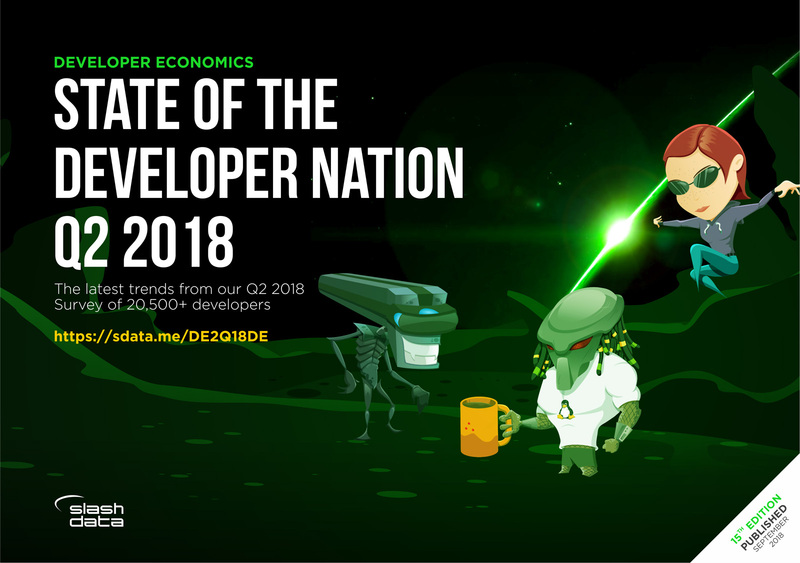 The 15th Developer Economics global survey wave ran in May and June 2018 and reached more than 20,500 developers in 167 countries. This research report delves into key developer trends for 2018 and beyond. The report focuses on six major themes - each with its own visualisations, showing how the data lends insight into the developer community. Data science: the top skill to learn in 2019. What are the top skills that developers want to learn or improve in the next year? We compare developer interest in twelve different skill sets, spanning from data science and machine learning to DevOps. Developers are interested in disrupting global economies but keep working on customising software. To gauge developer interest and better understand how advanced certain technologies are we asked developers what areas they were working on, learning about or are interested in. Programming language communities - an update. Updated estimates of the number of active software developers using each of the major programming language, across the globe and across all kinds of programmers. Evolving technology and new channels help more game developers make money. Game economics are changing, and streaming is becoming the dominant trend. Here we look at the evolution of business models in gaming in the past twelve months and discuss the driving forces behind it. Developers are decision makers in companies of all sizes. When it comes to choosing and buying technology, are developers powerless line employees, or are they influencers and decision makers? Big data and real-time predictions: to how many are they relevant? A race has begun to design processors capable of crunching large sets of often unstructured data and to produce real-time predictions. The question is, to how many in the rapidly growing data science and machine learning community are large datasets and real-time predictions relevant? Developer Economics 15th edition reached an impressive 20,500+ respondents from 167 countries around the world. As such, the Developer Economics series continues to be the most global independent research on mobile, desktop, IoT, cloud, web, game, AR/VR and machine learning developers and data scientists combined ever conducted. The report is based on a large-scale online developer survey designed, produced and carried out by SlashData over a period of seven weeks between May and June 2018. Respondents to the online survey came from 167 countries, including major app, machine learning and IoT development hotspots such as the US, China, India, Israel, UK and Russia and stretching all the way to Kenya, Brazil, and Jordan. The geographic reach of this survey is truly reflective of the global scale of the developer economy. The online survey was translated into eight languages in addition to English (simplified Chinese, traditional Chinese, Spanish, Portuguese, Vietnamese, Russian, Japanese, Korean) and promoted by 70 leading community and media partners within the software development industry. Chapter 6: Big data and real-time predictions: to how many are they relevant?